Regular unpaid overtime, low wages and safety risks are all parts of the day-to-day reality of being a Chinese police officer. However, they seem to have received more public scorn than respect in recent years due to allegations of police brutality. Liao Yujing decided to swap a life of helping the public for a life of stories. Liao, 28, was a criminal police officer for three years. But his heavy workload, mediocre wages and a lack of social recognition contributed to his decision to quit at the end of 2012. Now, a best-selling writer in Chengdu, life is much easier for him. Liao often feels sad when he sees news reports about the police. A college student showing his badly bruised buttocks following a police beating, a bandaged man laying on a bed with seven broken ribs who claimed he was injured by police, two young women whom police threatened to lock up with HIV-positive people, thieves and burglars - these are all stories that have gone viral online in recent months. The police are alleged to have abused these people either for filming officers or failing to present their identity cards. In one particularly high-profile case, Lei Yang, a Beijing-based environmental scientist who was detained on suspicion of soliciting prostitutes, died shortly after being taken into police custody on May 7. His family have claimed that police violated protocol and assaulted Lei. On June 1, the Changping district procuratorate announced that they will investigate the case and the five police officers involved. These stories, and many others like them, have inflamed public scorn and hostility toward the police, who have been accused of violent and arbitrary methods. Meanwhile, some scholars, cops and former officers have asked the public not to condemn all public security workers based on reports of abuse. Some have written articles claiming that people with malicious intentions are trying to provoke people into being anti-government by inciting anti-police sentiment. 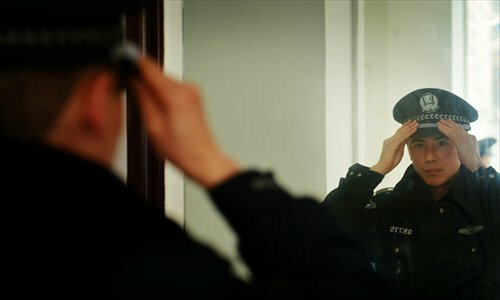 Due to China's relatively low police-to-citizen ratio, officers have to shoulder many extra responsibilities that their counterparts in many other countries don't have, said Wei Yongzhong, director of the police reform and development research center at the People's Public Security University of China. 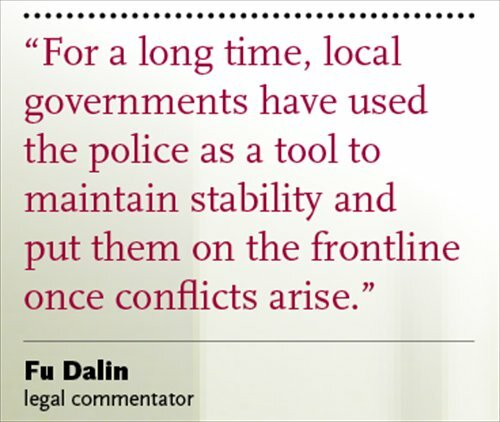 "For a long time, local governments have used the police as a tool to maintain stability and put them on the frontline once conflicts arise," Fu Dalin, a legal commentator said in a commentary published in the Beijing Times in May. "The police have become the representatives of the government in the eyes of the public, who throw all their discontent with the government at the police, which intensifies the tensions between police and the people," Fu said. Liao Yujing worked in Xinlong county, the Ganzi Tibetan Autonomous Prefecture in Southwest China's Sichuan Province. "The social order and environment is complex and the public has high demand on security. The police bear a heavy workload, but their salary is relatively low compared to other public servants. If possible, please give more understanding and support to them," Liao said in a recent entry on his Weibo. "We have to admit that there are irregular law enforcement methods which need to be penalized. But it's hazardous to amplify the situation and deny the whole team," he told the Global Times. In the cases mentioned earlier, the authorities responded either by penalizing the officers involved, suspending them from duty or announcing further investigations. Liao said that media usually tend to find fault with police but neglect to report their difficulties when they were abused. Police officers have to control themselves even when suspects abuse them. He recalled an incident in which a suspect's relative tore his clothes and scratched his head. During a routine traffic stop one driver, a high-level official, kicked him. Some new media platforms run by public security organs or individual officers are trying to burnish the police's image by venting their grievances and posing positive pictures and posts about the police. Nevertheless, Yu Guoming, executive dean of the journalism and communication department, Beijing Normal University, told k618.cn, a news portal run by Communist Youth League Central Committee, that the police should use practical actions rather than words to change the public's perception of their role. According to a 2007 Xinhua News Agency report, China has 1.6 million police officers, meaning there are around 12 officers per 10,000 people in the country. In 2006 a UN report stated that the global median number of police officers per 10,000 citizens was 30. In addition, as the idea that one should "turn to police whenever you are in trouble" is common in China, police are often asked to help with non-law enforcement problems. According to statistics released by the local public security bureau, in the Jiangsu Province city of Wuxi, which has 6.5 million permanent residents, police responded to a total of 2.7 million calls and more than 83 percent of them were regarding non-police affairs, such as people losing their keys, naughty children and locals running out of toilet paper at an inconvenient time. Besides being distracted by such trivial affairs, police are also asked to intervene in political matters, such as dispersing protests or putting people such as petitioners, dissidents and other politically sensitive figures under house arrest. Villagers in Wukan, a fishing village in Lufeng, South China's Guangdong Province, have been in the international spotlight in recent years after they kicked out their village Party chief over alleged illegal land grabs and elected their own leader. Since then, they have held many demonstrations against the local government. At a demonstration on Sunday, scores of uniformed cops and armed officers observed the protest. "We pity those young faces as they were sweating as the sun beat down upon them," a local resident A Wei told the Global Times. "But on another hand, we hate them. They ought to serve the people and protect our rights and interests. But now they stand against us and become the accessory of powerful corrupt officials," she said. Working overtime is normal for ordinary police officers. Chen Shuangqing, a traffic officer in Guiyang, Guizhou Province, said that he never gets to take time off during national holidays. "There are at least five days in a month we have to work for up to 17 hours a day," Chen said. "Holidays are often our busiest days." He also noted that officers only get a fixed overtime allowance of 480 yuan ($73) each month. Frequent overtime is one of the main reasons that officers quit the force. Wang Xin, who had served in a dog police unit in Beijing, said excessive overtime made him an unqualified husband, father and son, according to a letter of resignation he posed on his blog in 2014. Public security workers get less leisure time than many other workers, and some get even less time on the Earth. According to official figures, the profession's casualties totaled 27,907 between 2010 and 2015, including 2,567 deaths. The average age of the deceased was 46 and most of them died of sudden diseases, traffic accidents or violent attacks. Police in China's restive far western Xinjiang Uyghur Autonomous Region which borders eight countries including Pakistan and Afghanistan, suffer more pressure than most others due to their fight against separatism, terrorism and extremism. Following the deadly July 5, 2009 riot in Urumqi, police patrolling the streets became a common sight across the region. A SWAT officer in Xinjiang complained that while on special operations to capture terrorists, he had to stay in remote mountainous Gobi desert for months. "As we have to keep our tasks confidential, misunderstandings and conflicts easily happen between couples," said the anonymous cop. "The divorce rate among the public security officers here is rather high." Zhang Chunxian, Party chief of Xinjiang, told media in March last year that the death rate of public security workers in Xinjiang is 5.4 times the national police death rate. To help relieve their pressure, Beijing authorities launched a three-month campaign in January, in which bureau-level police officials worked at busy grass-roots organs in the city to learn about the difficulties faced by their lower-level colleagues. However, such a method is just a temporary solution. Wei said it's hard to increase the size of police forces at a time in which the country is streamlining its quota of public servants. "The solution to workload reduction and enforcement regulation is to change their functions, upgrade their technology and efficiency, and clarify their responsibilities," Wei noted, adding that the police responsibilities are still too wide and unclear. In May, the Central Leading Team for Comprehensively Deepening Reform, led by President Xi Jinping approved a revised version of specific regulations regarding how public security organs enforce laws, aiming to upgrade the police's credibility and enforcement levels. The Beijing police has also piloted "one-stop" case handling since October 2015 in a law enforcement and case handling center in the city's Haidian district, which ensures suspects are handled according to standardized procedures and are under 24-hour video surveillance once they enter the center, Xinhua reported. Wei advised the government to improve public security department's ability to respond to allegations of misconduct. "Once a negative case happens, the authorities need to respond quickly and wisely, so as to clear the public's doubts," he said. He believes the wide use of smartphones and the Internet is a double-edged sword for police. "On one hand, it can easily help footage of a single poor or violent action quickly spread and accelerate its negative impact. On another, it intensifies the public supervising power, pushes the police to improve law enforcement, and promotes justice and equity," Wei said. He said people's awareness of their rights and interests have grown, but their respect for the law and consciousness of their legal obligations are still lacking.